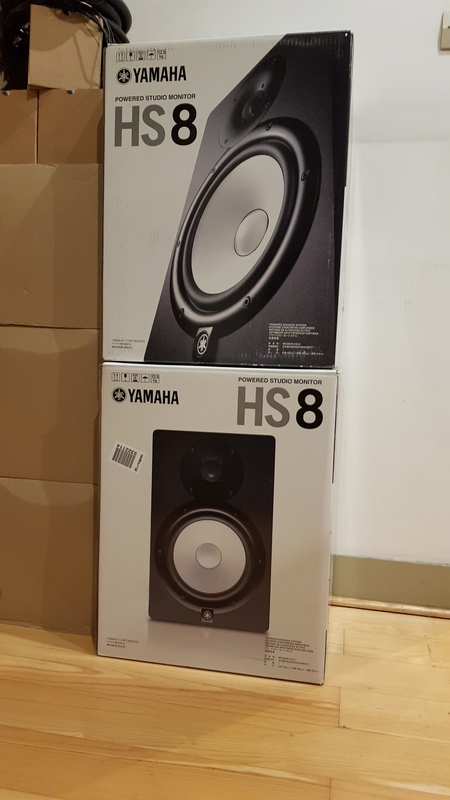 HS8, Active Monitor from Yamaha in the HS series. Thebrored's review (This content has been automatically translated from French)" Top Notch"
Power is forcment the appointment. We obtain frequencies that do not flatter pieces except better mixes, and it subsequently falls directly imperfections. It is noted that the addition of a subwoofer becomes optional, due to the ability to reproduce the low frequencies of these speakers. However, in view of a mastering in 5.1, I highly recommend it. I essentially serve with m-audio firewire 1814 and small cables XLR / Jack for more quality. I basically consists of electro, rock, pop, jazz mainstream, even though I love getting the most out of the speakers to experiment rather-in Logic Pro X connected my keyboard be. The stro image is excellent, after proper positioning of the speakers (ear height for tweeters, foam or gym mats as insulation placed below), the pieces of my Itunes library in Apple Lossless comes with a really startling transparency. The sound is clear, and it prcis redcouvre songs. 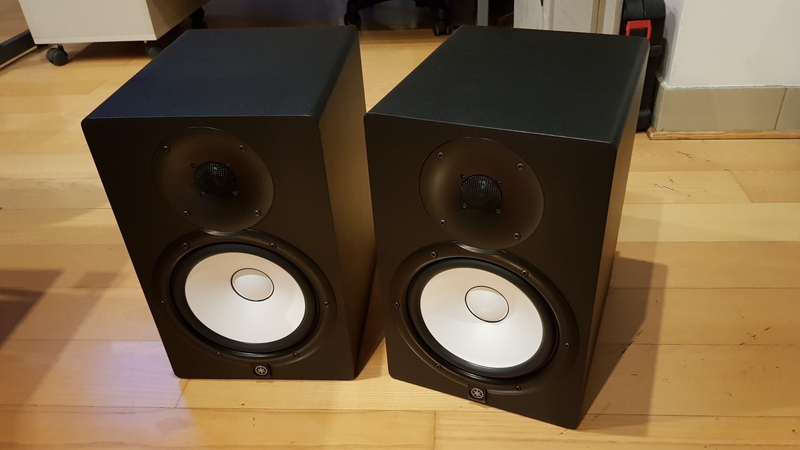 The frquence curve is neutral (normal for this type of hardware), but I highly recommend these speakers rather than 8 HS HS HS 5 or 7, which are only models of rduits their big sister. Unless they are second hand. I wanted to acqurir departure of Focal CMS 40 and compared SIZE / QUALITY / PRICE, I prfr them. For mastering, it is the ideal equipment issue. The price-quality ratio and most comptitif in this kind of hardware. Indeed, the reputation of HS from Yamaha no longer do, and this rdition only confirms the speaker reputation who have heard of the securities of the greatest artists of the world. Certainly there better (Focal to name a few), but this level is the intermediary that amply suffice any amateur or semi-profrssionel his fanatic. I prviens all readers, once purchased, you are stupid you Sparer, and only admirers of another brand opt for diffrentes speakers. They must be compltes with BON hardware and the quality of wiring in a compatible practice environment. I am also very critical of M-Audio speakers that do not measure up in a comparative test. For those who visit, go try them out. For those who ask for a future purchase, go buy them. 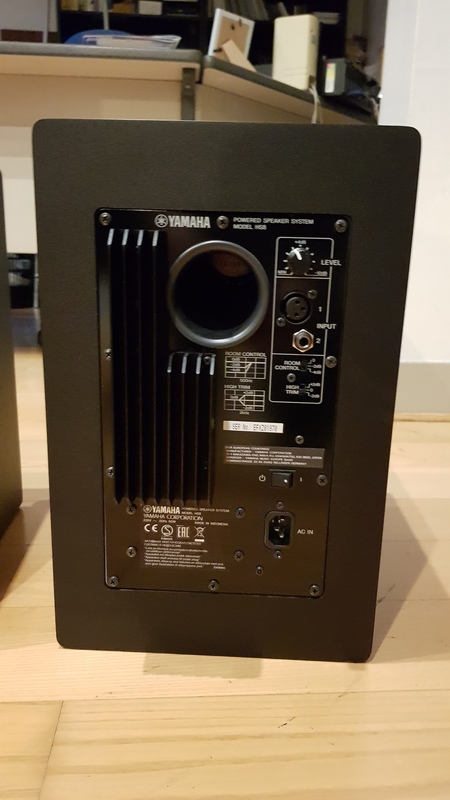 Ps: I do not work for Yamaha Corp.
fwedewe's review (This content has been automatically translated from French)" Very appreciable"
Side power, nothing to say, for my home studio is a bit "too much" and I could never really push me, unless I put all my neighbors back. The rear settings seem sufficient to correct certain frequencies knowing that I tried but I finally left everything in the neutral position. The connection is good. Switches could be placed in the brand logos at the bottom of the enclosure because, given their depth, sometimes you have to twist a little. Nothing serious though. When I connected, I must admit I was a little confused during the first hours of listening because my marks were messed up. And yet, I felt a real improvement, something much more detailed in the music I diffusais the speakers. In fact, the medium, and especially the treble, really shone and I rediscovered the songs I compounds or music I like. Listening to tracks by artists that I love, it was clear that I could now enjoy more quality mixes, the difference with Alesis seemed obvious. Despite these positive aspects, however, I thought it was surprising that, given the size of the largest membrane, bass do not show that much as my old speakers were a little more generous on this side. After several attempts, I realized it was obviously very important to follow the investment to take advantage of the lower spectrum. Once the positioning triangle observed and available at the right height of the ears, therefore the entire spectrum appears. And then it gets even more interesting. Finally bass and bass drums that sound and, above all, that we can discern perfectly. What amazed me the most is the quality of the rendering in these frequencies. With Alesis, all sounded a bit "fat" while yet, headphones, or other eavesdropping systems, it was not so thick. With HS8, I phase: if a kick does not sound "heavy" in the original mix, now it is transcribed as is. Similarly, the sounds of bass, acoustic or electric, we clearly see the grain better and the attack of the fingers on the strings, it is more obvious. The purchase of these speakers was a revelation and a rebirth for me. I rediscovered some songs and able to appreciate all the details. I have recently and I have not yet had the opportunity to really mix with but it will be soon. However, I had the opportunity to make small corrections to some of my compositions recently and I could instantly identify certain defects inherent in my mixes made on Alesis, especially on the high end sometimes a little too far. Just do not forget to place them properly in the studio to collect the body from the bottom of the spectrum. Thebrored's review (This content has been automatically translated from French)" Excellent"
Power is necessarily in the appointment. Frequencies that no flatter pieces except better mixed is obtained, and subsequently falls directly on the imperfections. It should be noted that the addition of a subwoofer is optional, because of the ability to reproduce low frequencies of these speakers. However, in view of mastering 5.1, I highly recommend it. I use it mainly with a m-audio firewire 1814 and small cables XLR / Jack for more quality. I consists mainly of electro, rock, pop, jazz mainstream, even though I love to enjoy the potential speakers to experience the rather-in Logic Pro X connected to a master keyboard. The stereo image is excellent, after proper positioning of the speakers (ear height for tweeters, foam gym mats as insulation placed below), the pieces of my iTunes library, Apple Lossless format comes out with a really transparent striking. The sound is clear, precise and songs are being rediscovered. 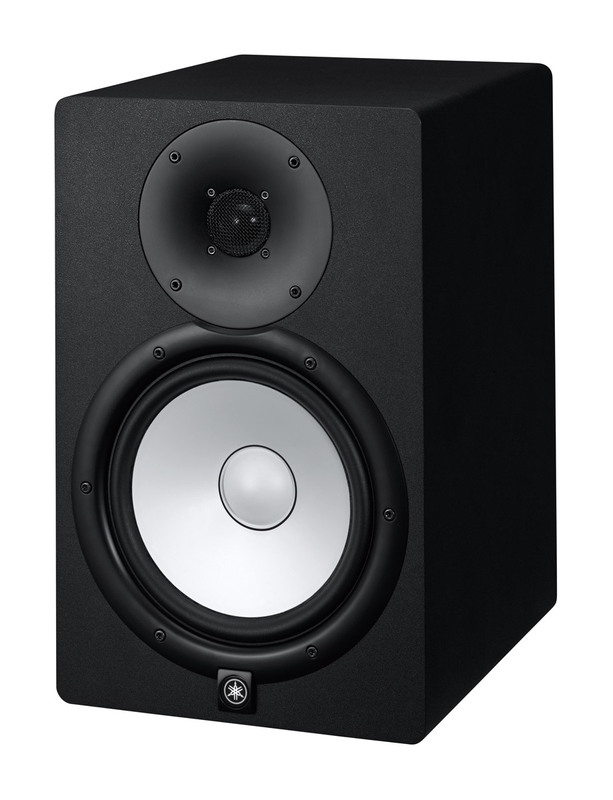 The frequency curve is neutral (normal for this type of material), but I highly recommend these speakers HS 8 rather than 5 or HS HS 7, which are only reduced their big sister models. Unless they are second hand. 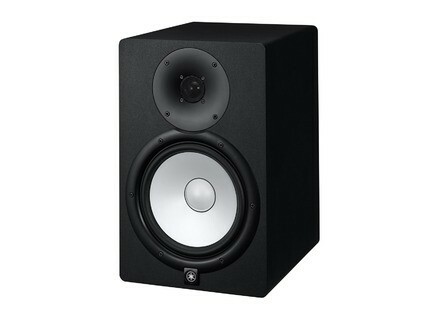 I wanted to initially acquire Focal CMS 40, and SIZE / QUALITY / PRICE report, I preferred them. For mastering, it is the ideal equipment item. The quality and most competitive price in this material report. Indeed, the reputation of Yamaha HS is more to do, and this reissue merely confirms the reputation speaker who heard the titles of the greatest artists of the world. Certainly, there is better (Focal to name a few), but at this level it is the intermediary who would more than any amateur or semi-profrssionel fan of his. I warn all readers, once purchased, you will find stupid you separate, and only admirers of another brand opt for different speakers. They must be supplemented with GOOD equipment and wiring quality in a compatible environment for the practice. I am also very critical of the M-Audio speakers that do not make weight in a comparative test. For those who visit, will try. For those who ask for a future purchase, run buy. PS: I do not work for Yamaha Corp..
Sergeï01's review (This content has been automatically translated from French)" The bomb"
I used to produir, scratch, mix and listen to the sound. The sound is clear in the upper midrange and there is good bass. These speakers sound like it should. It is a quality of crazy. 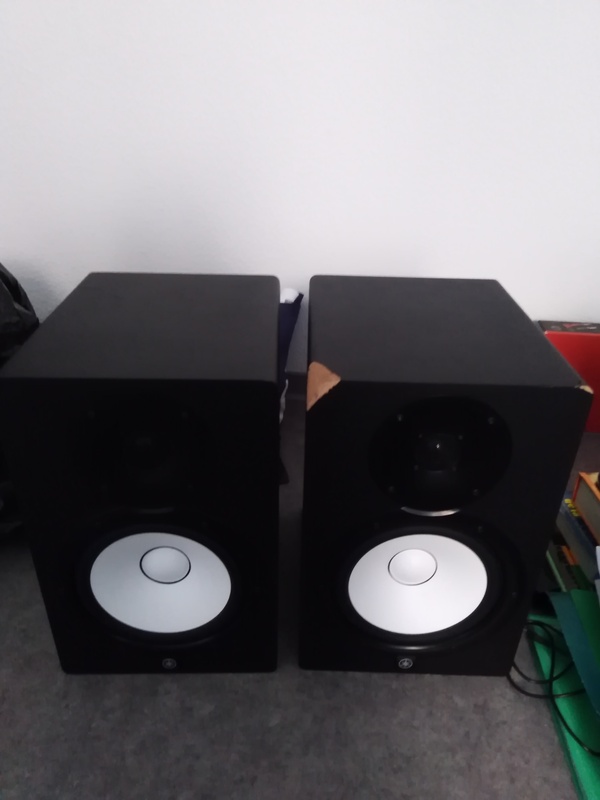 I could listen to different speakers store, they have the best value for money. Yamaha will unveil today at Musikmesse the new HS active monitor generation, with three 5", 6.5" and 8" monitors and an 8" subwoofer.